Sequels, seemingly, rarely live up to their former incarnations. Series like The Matrix, Ghostbusters, and Die Hard, all took the originality, and fun of the first, and hardly lived up to their mandate with the second movie. Sometimes, though, like Terminator, they take on the ideas of the first, and build something as good, or better. 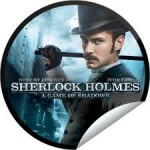 Sherlock Holmes: A Game of Shadows falls more toward the latter, than the former, being a very good follow up to the first movie. The action is well spaced, and seldom drags (like some other action movies can). My wife, a consummate hater of most action movies (to the point that she really dislikes the new Batman movies… I know, right? ), actually enjoys both the first, and now the second Sherlock Holmes. The only actor that was slightly awkward from the first movie was quickly “dispatched” in this movie. Robert Downey Jr. does a wonderful job as Sherlock Holmes for the same reason he does so well as Tony Stark… he has a certain boyish arrogance about him. I’ve heard in real life he’s an extremely down to earth, humble, enjoyable guy, but he plays the part SO well at this point, it’s hard to tell. And the combination of him and Jude Law makes for an extremely good combo (may not Clooney/Pitt, but close). But, I digress. The movie flows much as the first, and like the first, it tends to drag JUST a bit about 3/4th of the way through the movie. Classical story tellers would probably say this is normal as it’s the “calm” before the climax, and that may be the reason for it in this case. It’s only noticeable while it’s going on, and once that drag is over, you’ve soon forgotten about it. And like the first, the viewer is left wondering what exactly is going to happen from scene to scene, and by the end of the movie, things wrap up nicely. Short of the first Mission Impossible, there has seldom been a action/mystery that has been quite so “ahhhh” at the end. All and all, a solid movie, that’s well worth the price of admission, and will definitely be, like the first, something I purchase on DVD and watch many a time. The biggest question in my mind is, how will they live up to this, and the previous movie, in the third. But, I have the same concern about The Dark Knight Rises.